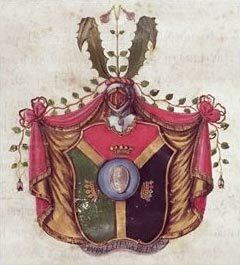 Description: Coat of Arms of Carl von Linné (Carolus Linnaeus), from his Letter of Nobility. The crest is a twinflower, one of Linnaeus' favourite plants. The shield is divided into thirds: red, black and green for the three kingdoms of nature (animal, mineral and vegetable) in Linnaean classification; in the center is an egg "to denote Nature, which is continued and perpetuated in ovo". Motto: FAMAM EXTENDERE FACTIS "to expand fame/reputation by deeds".